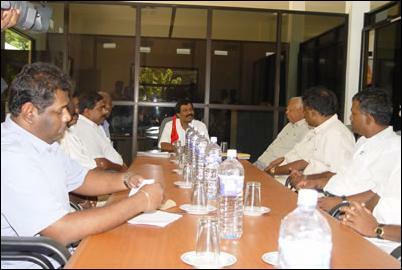 Mr. S. P. Thamilchelvan, the political head of the Liberation Tigers of Tamil Eelam, met with parliamentarians of the Tamil National Alliance (TNA) on Wednesday at the Kilinochchi peace secretariat, LTTE peace secretariat sources said. On behalf of the TNA, parliamentarians Messrs. R.Sampanthan (Trincomalee), Mavai Senathirajah (Jaffna), Gajendrakumar Ponnampalam (Jaffna), Selvam Adaikkalanathan (Vanni), Raja Kuhaneswaran (Vanni), Sivasakthi Ananthan (Vanni), M.K.Sivajilingam (Jaffna), A.Vinayagamoorthy (Jaffna) and Suresh Premachandran (Jaffna) participated at the meeting. According to the sources, Mr. Thamilchelvan briefed the TNA MPs on the LTTE’s counter proposals on the Interim Administration for the Northeast, which the organization intends to submit to the Government of Sri Lanka via the Norwegian facilitators by the end of October, and the current political situation in the country. Mr. Sampanthan, the TNA’s parliamentary group leader, said that, as it is the first time that the LTTE will be submitting its concrete set of proposals in writing, they discussed the proposals at great length, the sources said. Mr. Thamilchelvan is to hold a similar meeting this weekend with Tamil parliamentarians from the central hills, including Mr. P. Chandrasekaran and Mr. A. Thondaman, who hold ministerships in the United National Front Government of Sri Lanka.